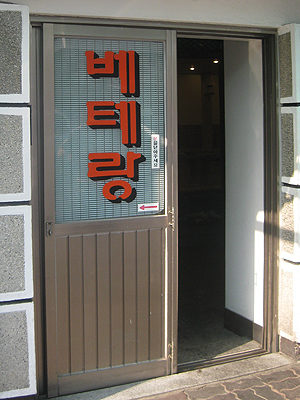 After a little bit of research, we opted to try Veteran (베테랑), an unassuming restaurant that is famous for its wild sesame knife-cut noodle soup (kalguksu) and dumplings (mandu). People reportedly drive from around the country to eat at this fast-paced, jam-packed restaurant — and I can see why! Evan and I decided to play it safe and order one of everything on the menu — and judging from the fact that the menu only had three things on it, we were sure we wouldn’t be disappointed. 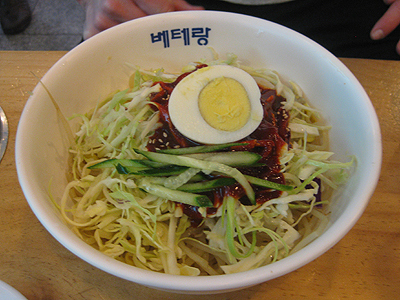 We began our meal with a dish of jjolmyeon (쫄면) cold noodles slathered in cabbage, cucumber, a spicy red sauce and topped with an egg. The noodles were chewy, and perhaps I would have liked this bibimguksu (mixed noodle) dish more if the sauce was a touch less sweet. Either way, it was nice, but completely forgettable by the time our next plate arrived. 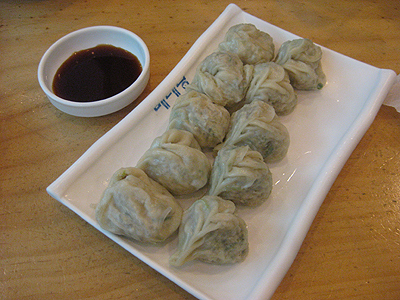 The mandu (만두) were up next, and they were tiny explosions of flavor wrapped in thin, chewy shells. All too often I find that the wrap, especially with steamed mandu, is too thick or overpowering to enjoy the filling. Not so here! These soft dumplings were stuffed to the brim with sweet potato noodles, pork, and a multitude of spices. Even Ev, who generally doesn’t like steamed dumplings, couldn’t get enough of them. Definitely the best mandu I have had here! 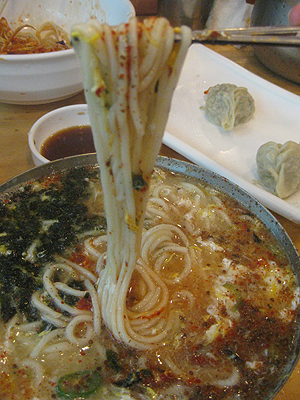 The last dish to arrive was the kalguksu (칼국수) and my only regret is that this soup didn’t come first so we could actually finish it. It was so delicious. The thick, chewy noodles (cut with a knife, not spun, hence the name) had a texture reminiscent of Japanese Udon noodles, and sat in a rich, egg-laced broth. They were topped with soft egg whites, roasted seaweed, red pepper powder and wild sesame seed powder, which I had enjoyed in bibimbap before but never knew what it was! The resulting dish was a hot, spicy, salty, comforting soup with a broth similar to egg-drop soup. 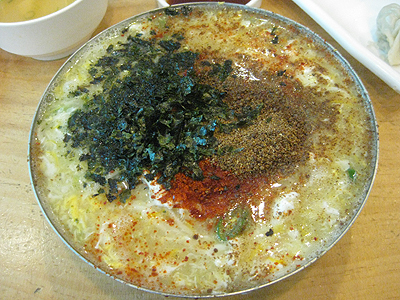 The powdered sesame added another nutty flavor, elevating the umami elements of the dish. It was excellent, and very deserving of it’s country-renowned reputation. 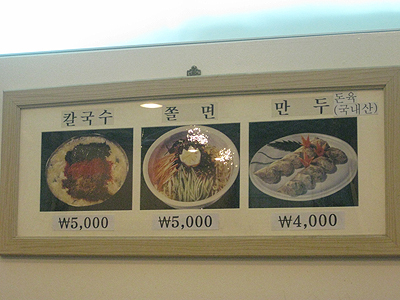 Of course, it wouldn’t be a meal in Jeonju if it weren’t served with pickled radish rounds and a type of kimchi. This particular one is made with daikon radish (kkakdugi 배추) instead of the normal napa cabbage. I happen to prefer kkakdugi to normal kimchi, because I enjoy the flavor but can’t get past the texture of the fermented cabbage leaves *shudder* It reminds me of wilted lettuce that has sat in the crisper too long and has begun to brown. Eek! 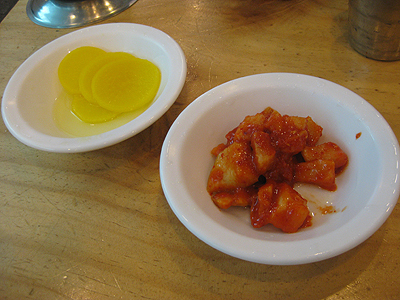 However, this particular kimchi was fermented in a sauce that was — wait for it — way too sweet for my liking. Note to any potential future Korea residents: if you don’t like sugar or everything with a sickeningly sweet twist, don’t bother getting on the plane. Now, I love me a Snickers Ice Cream bar every once and awhile, but the culture here has such a massive sweet tooth that they load the white stuff into everything from pizza sauce and bread to ramyeon! Enough natives… enough. The kkakdugi at our neighborhood kimbap spot, however, is perfection. Gimme gimme. The shopping part of the trip was considerably less successful than the eating — despite poking our heads around various shops, we didn’t find anything to satisfy our souvenir wish list. We are off to Seoul this weekend to finally visit the DMZ (yay!) and we plan on taking a look in Insadong for Korean gifts for our loved ones. 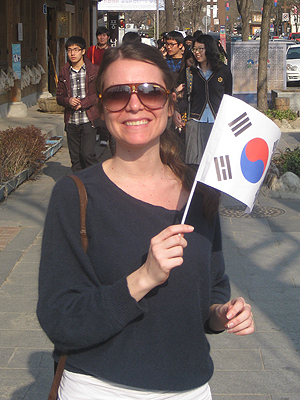 Wish me (and my Korean flag, compliments of the tourist hordes in Hanok Village) happy hunting!